Max Robertson's 1974 Mk4 Norton Commando 750. The Norton Commando is one of the most uniquely styled motorcycles of all time, with its share of detractors and well as legions of fans. Here are two examples of a different spin on a classic theme. 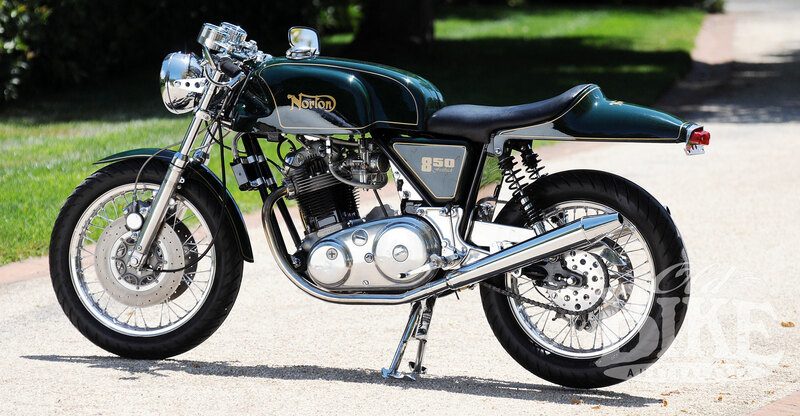 When Norton’s new owners, Manganese Bronze Holdings ditched the hallowed Featherbed frame and embarked on the radically-style Commando in 1967, purists winced. 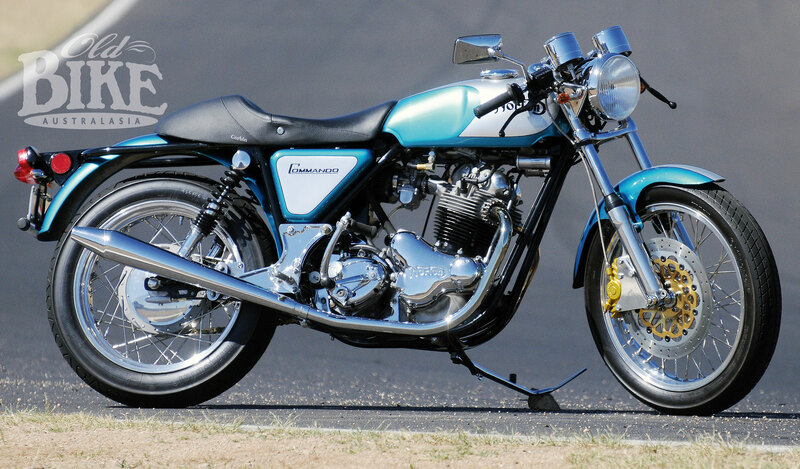 Many believed that the Commando’s designers had thrown away the best part of the design that had its mechanical origins in the original 497 cc Model 7, designed by Bert Hopwood and launched in 1948 to combat the similar parallel twins from BSA and Triumph. 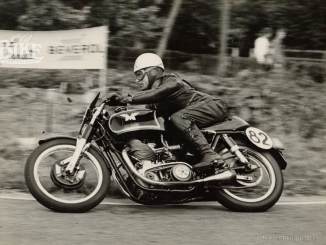 The Featherbed chassis, designed by the McCandless brothers and first seen on the works 350 cc Norton in 1950, found its way into the road bike range three years later and gained a deserved reputation as ‘the world’s best road holder’. The original frame, known unofficially as the Wideline, gave way in 1960 to the Slimline which had a narrower rear section, and was used on everything from the International and ES2 singles to the Dominator, 650SS and finally Atlas twins. Faced with serious challenges to their traditional ‘big bike’ market by Honda’s CB750 and the BSA/Triumph triples, Norton bit the bullet and started with an almost clean sheet of paper. True, certain tried and proven components were carried over from the earlier models, notably the engine and AMC four-speed gearbox and the front and rear hubs (the front now a twin leading shoe design), but pretty well everything else was new. The Atlas, with the original engine capacity stretched by 50% was as notable for its vibration as for its fine handling, and the Commando sought to address the former. At the heart of the matter was the revolutionary Isolastic method of mounting the engine and gearbox within the frame – the work of former Rolls Royce engineer Dr. Stefan Bauer, and Norton Villiers engineers Bernard Hooper and Bob Trigg. This involved isolating the power and transmission units from the frame by means of rubber bushings, and dispensing with conventional engine-to-frame mounts and the normal rear swinging arm pivot. First seen at the 1967 Earl’s Court Show in London, it took nearly six months before production models began to emerge, and then with mixed results. The original frame design, a full double cradle hung from a large section single top tube, had flexing problems, exacerbated by the critical tolerances between the rubber bushes and mounting bolts, and was modified for the 1969 year production, which moved to a new facility at Andover near the Thruxton air field and race track. From 1969, the standard Commando became known as the Fastback, while another US-inspired version with a high-mounted exhaust system was called the ‘S’. Soon after a third variation, designed for production racing and carrying a single front disc brake, was added. The first Commandos employed 73 mm bore with 89 mm stroke, as on the Atlas. For the 1972 production year, an up-rated engine, known as the Combat and poking out 65 bhp at 6,500 rpm, was introduced. Alas, the Combat proved a fragile motor, particularly in the bottom end where main bearing failures were commonplace. In a bid to improved reliability, the compression ratio on the final incarnation of the 750 engine, known as the Mark V, was reduced from 10:1 to 9.4:1 for 1973 production. Things were far from rosy in the Norton Villiers camp by this stage. A government bailout of the collapsed BSA Triumph group in 1972 had seen the formation of the subsidised Norton Villiers Triumph, but things went from bad to worse and in 1973 redundancies began at Andover. This led to an occupation of the workplace by employees, a situation that continued for many months and resulted in the withdrawal of the government subsidy. Production of the Commando, now fitted with the new lower-stressed 828 cc (77 mm x 89 mm bore and stroke ‘850’) engine, was transferred to Wolverhampton and the old BSA works at Small Heath. Despite the industrial chaos, which had spread to the infamous Meriden strike, NVT managed to produced several new Commando models, including the Mk 2a Interstate. With yet another engine variant, now fitted with an electric starter and the obligatory left foot gear change, the 1975 production saw the Commando range reduced to the Roadster and the Mk 3 Interstate, with a specification that would remain unchanged until the final Commandos were produced in 1977. In all, around 55,000 Commandos were built in the ten years of production. For all its faults and idiosyncrasies, the Commando attracted a large and loyal following during its production lifetime, and is today more popular than ever. Thanks to advances in technology and materials, virtually all of the Commandos problems have been eliminated by modern after-market components. In the 35 years since production ceased there have been several attempts to re-launch the Commando, to date with a singular lack of success. The latest venture involves UK businessman Stuart Garner, who purchased the Norton name from its US owners in 2008 and has announced plans to manufacture a Commando-styled machine at a new facility in the British midlands. There is an unmistakable family resemblance in the Commando 961 series, but for diehards the last real Commando slipped quietly out of Small Heath in October 1977. The neat package in front of the rider is greatly enhanced by the Ace Bars, fitted in the ‘down’ position (the reverse of the popular fitment for bikes like the Kawasaki 900 in the 1970s). These snugly encircle the speedo and tacho and give a comfortable, sporty riding position which is not as radical as clip-ons and allow the original stainless steel headlight brackets to be retained. A Yamaha switch block looks completely at home. The ‘project’ occupied a little over twelve months and the obvious signature is the stunning paintwork, applied by another Dubbo tradesman, Robert Layard. The Corbin Gunfighter seat looks the part and is surprisingly comfortable. A further local link is engineer Lionel Simpson, a man well known for his fabulous racing Rob North Tridents. “Lionel rebuilt the engine from scratch,” explains Max. “ He never does anything unless you’re there because he explains everything as he goes. It was rebored, new pistons, billet ‘USA’ conrods, and a lot of time spent on the crank assembly with Superblend bearings, getting the end float spot-on and repositioning the engine breather, and in assembling the timing gear tension right – makes a nice tight motor. I used a single 34 mm Mikuni carb with a K&N filter for better bottom end performance. The rear sets I sourced through Norvil and they bolt straight on – a perfect fit and the quality and workmanship is very good. The front mudguard is also from Norvil. The electrics are modified; Boyer ignition, Gel battery with a 12 volt single-phase rectifier which has eliminated boxes of electronics – all it has is a voltage regulator, ignition switch, blinker can and two coils. All the stuff under the tank has been eliminated. If it looks right, it usually is right, or so the maxim goes, and the Robertson Commando certainly looks right. Whenever it appears at shows and rallies, it’s a crowd stopper – unmistakably a Commando but with a high dose of individuality and meticulous attention to details. When our photo session was completed one sunny morning at Mount Panorama, Max handed me the keys. “Take it for a ride, you’ll enjoy it.” I didn’t need to be asked twice, although I’ll admit here that I have never been a real fan of the Commando. The early ones looked to me like a Metisse gone wrong, and I was one of the trad set that condemned the death of the Featherbed frame. 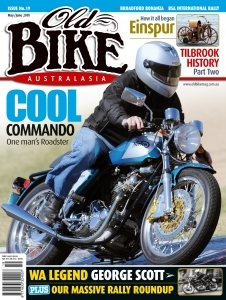 I had fond memories of riders like Vince Tierney, Jim Whyman, John Thurgood and Garry Thomas on 650SS Nortons, going like blazes around Bathurst and Oran Park, and somehow I couldn’t quite see a Commando getting up to those sorts of tricks. A few mates of mine had early Fastbacks, and they vibrated, leaked oil, and broke down fairly regularly. 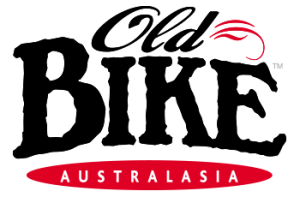 Probably the turning point in my attitude came with the very first issue of Old Bike Australasia, when my late mate Michael Robinson wrote up Pat Holt’s 850 in such glowing terms, and explained how most if not all of the foibles and gremlins of the earlier models had been eliminated. Anyway, regardless of the metallurgy, Max’s special Commando is a thing of beauty – as cute as can be. Maybe it’s the baby blue décor, but the bike looks so svelte and sleek. It’s clean – thanks to Max’s attention to detail in getting rid of the tangle of cables, the choice of seat and the smart looking front end. Mindful of the ever-present local plods, who patrol the famous circuit incessantly and add considerably to the force’s coffers with fines should you exceed the 60 km/h limit, I set off at a sedate pace, more interested in the power and handling characteristics than setting lap records and donating to the policemen’s ball. The very first thing you notice is the almost complete absence of vibration; it’s as smooth as a sewing machine and pulls lustily from nil revs. The clutch is light and engages like a hot screwdriver through a vinyl seat; no shudder, no grab, no slip. As I said, it was a sedate ride, and a short one, but I did allow myself a quick squirt through the ‘new’ bit of the circuit – The Chase – which is an interesting left/right flick with a rise in the middle. The Commando soaked it up as if it wasn’t there, changing direction as if by magic and surging over the crest with a surfeit of mid-range grunt. What can you say? Terrific handling, plenty of power, excellent brakes, sweet transmission. No sooner had I pulled up to report my findings to Max than we were joined by an elderly gentleman and his wife who ever obviously out on a morning drive around the circuit. He quickly parked his car on the edge of the track and strode over to gaze at the bike. “A Norton”, he said with a faraway look in his eyes. 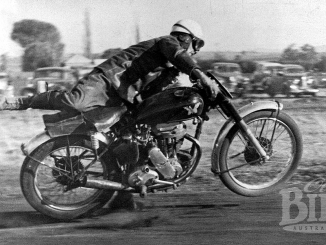 “I rode a Norton here in ’48…” Yep, it’s that kind of bike. If you need to find Max and his Commando at any rally, just look for the crowd. Ian McKay’s Norton 850 Commando. More’s the pity, because Ian’s Commando is a real head-turner and bristling with neat work and original thinking. Hopefully when the McKays complete their planned home move in the near future, that leisure time will return and the stunning green 850 will be seen in action again.